Need approximately 15" on each side. Top and bottom strip with corner 9p are not sewn on. Suggestions please. I sometimes make a wide piano key border on my scrappy quilts. You could then do a pinwheel corner stone. Then a Final solid border to make up your inches. How wide can i make a piano border? Pretty top! It looks like your pin wheel blocks are about 12 inches. I would just add more of those until it was the size you want. 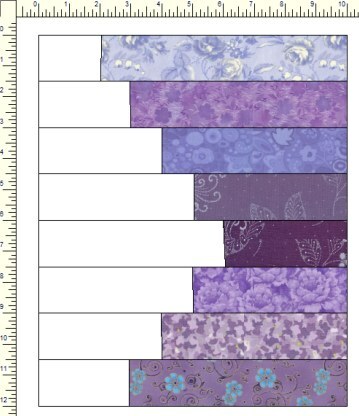 This is a type of piano border, 10" wide (larger or smaller) + your current border. Love the mauves - and your quilt. You could also make the border with more pinwheels. Last edited by Gay; 05-17-2018 at 08:27 PM. This is gorgeous! Since the 15" is going to hang over the side of bed, I'd recommend the piano key or flying geese. You've also got the 9P corner stone you could go with. Perfect set-up for a scalloped edge, too. Just thinking out loud...lol..
Changed my mind...I like Gay's suggestion. If I had more of the fabric used in the quilt, I would add 2 more rows of pinwheels after the pieced border. You will probably have to increase the border width to the size of your pinwheels to have the math come out. I also like Gay's suggestion! I really like the idea Gay shows with the border. It would add the right touch of interest to the quilt. 9 - strip - 9 - strip - 9. This would add 12" to each side and if you use a bit wider binding (ending 1") that would bring it to 13" each side. I can't think of how to increase it any more and keep a balance. If your finished strips and 9 patches are a 2 1/2" or 3", then problem solved, you will have the desired increase. Please be sure and post a pic of the finished top. I absolutely love the colors! Each pinwheel block measures 5 3/4". The strips and 9 patch are 1". Totaling approximately 55 X 72. Still need additional 15" per side. Have plenty of fabric leftover. All suggestions appreciated. Beautiful quilt! And I love Gay's idea for additional border. Beautiful quilt. I always add a piano key border on my quilts if I want them bigger then you can make it as wide as you want. I agree with the ideas here and hopefully these will give you some options that work for you. Good luck and please share a pic when you are finished. 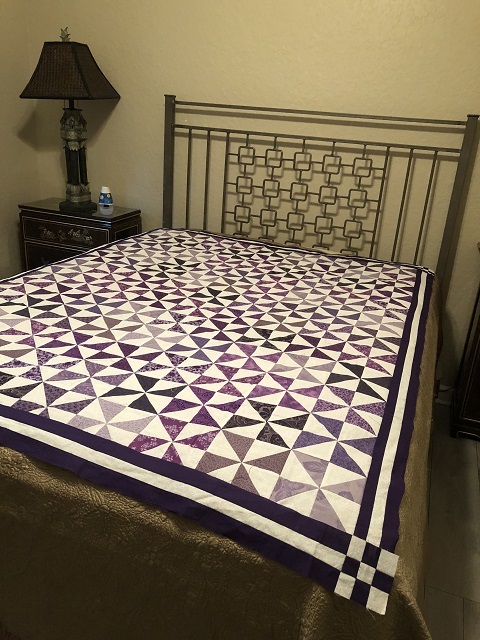 Just went back and looked at your quilt and if you have extra fabrics from your pinwheels-that is what I would suggest you use to make the piano key border if you decide on that style of border. How about another row of pinwheels with a repeat of the current border? why not add more blocks? 15" on each side seems a lot to me. But as always that is only my opinion. This is a beautiful quilt. 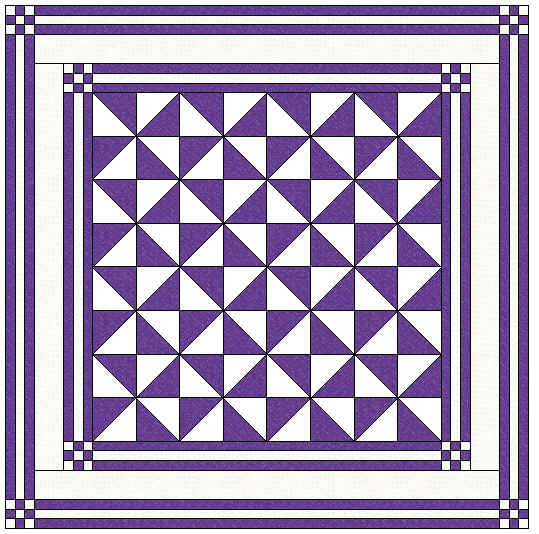 What about making a border of all the purples, of perhaps 10" square blocks, then your white 5" (finished), and a scrappy purple binding? That might be the easier solution without being too busy. Or, instead of white 5" border, make 5" pinwheels, but that's a lot more work. Thanks for all the suggestions. After staring all day and trying some of the ideas I decided to stick to the original plan and just finish putting on the strips with 9p corners and bind. Although it looks like a ton of leftover fabric I wouldn't have enough to do more rows. Thank you. Finished attaching the borders, working on a hopefully unique back.